Extra credit, minutes and texts for international top ups sent to Cuba, on HablaCuba.com. 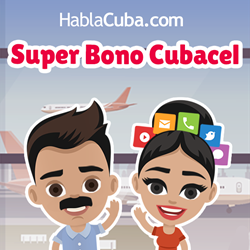 This November, Cuban expats get the chance to send special bonuses to their family and friends back home in Cuba, thanks to the new Cubacel promotion that starts on November 13 and is open until November 17. The offer valid between November 13-17, 2017 (23:59 EST) for recharges between 15 and 60 CUC. The promotional balance for deals including SMS and minutes can be used until December 10, 2017 (23:59 EST). The promotional balance for deals including only free CUC can be used until December 3, 2017 (23:59 EST). Besides the offer, HablaCuba’s Facebook page also hosts a contest. Cubans are invited to share the name of the Cuban region where they were born or where they grew up. The contest is open until November 14. The winner will be picked randomly and will be awarded 20 CUC which can be converted into 50 CUC + 20 minutes + 20 SMS during the Cubacel promotion.